From 1670 - 1930, the fur trade in the central area of the NWT thrived on beaver, mink, marten and lynx. From 1909 - 1970, the Inuvialuit in the north prospered from a fur trade which consisted almost entirely of white fox. The roots of the white fox fur trade reach back to the Mackenzie Delta whalers in the 1880s. The American whaling ships were also interested in trading for furs. Aklavik (map) and Herschel Island quickly became centres for this new trade and the profits available soon became evident. Finally recognizing the value of the white fox trade, the Hudson’s Bay Company opened its first new post in 72 years at Aklavik in 1912. By 1924, the wealth of the white fox trade had produced a fleet of 39 privately owned schooners and had revitalized the economy in the region. 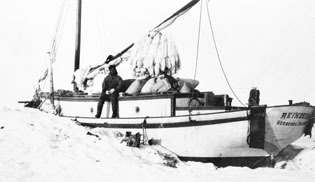 Using their new schooners, the Inuvialuit were easily able to expand the trapping and trading of white fox beyond the Mackenzie Delta region . In 1928, several families moved to Banks Island and recorded huge harvests of white fox. The island was designated a game preserve for the Inuvialuit and it continued to be a productive trapping area. Eventually, less demand and lower prices led to the decline of the white fox trade, and the fur trade in general.